Is it really a "daily vape"? Innokin has brought us a lot of good stuff over the years. I’m a big fan of their recent tank, the Innokin iSub B Sub-Ohm Tank and their Proton kit. I have yet to try a pod system by Innokin, so I thought that the recent Innokin DV Pod System would be a nice place to start. While I prefer sub-ohm vaping, I use pod mods quite a bit when I’m out of the house, because they’re simply easier to carry. 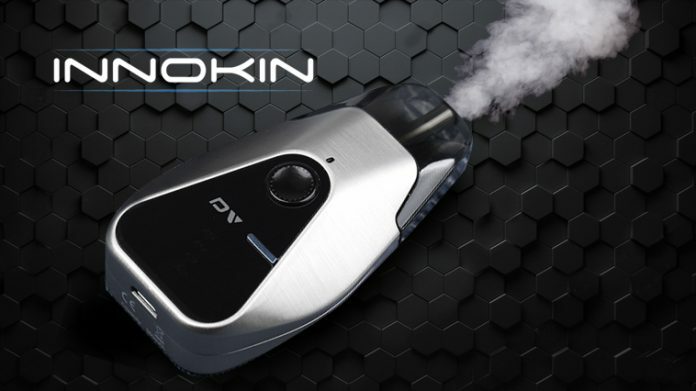 After looking at Innokin’s product information for the DV, I found that the letters stand for “Daily Vape.” Obviously, Innokin wants this product to be the vapers’ go-to, everyday device. But is it worthy of that name? While some may not be a huge fan of oddly-shaped pod systems, I really like the way this one looks, as well as feels. Some users have compared the shape to car remote keys, but I think it’s more like a rounded arrowhead. It fits nicely in my hand easily, feels discreet, and isn’t at all bulky or weighty. The back side of the Innokin DV Pod System features a black honeycomb design. On the opposite side, you’ll see the DV logo, a little display screen, and a button. We’ll get to those later. As far as colors, you can find this system in black, white, and silver, but all of the pods are the same gray/black color. The materials used on the DV Pod System are a mix of zinc alloy and plastic. I think it’s built pretty well for this sort of pod system. I can’t see the device breaking too easily unless you excessively drop it, roll over it with your car, crush it, or put it through any other destructive accident you can imagine. You get the picture: the Innokin DV Pod System is one of those longer-lasting systems, like the SMOK Novo Pod System or something else comparable. The internal battery is a 500mAh, which charges in about an hour and a half or less. There is a micro-USB port on the device for charging. Aside from the mod/battery and the detachable pods, there are no other components to the device. One of the notable selling points for the Innokin DV Pod System are the coils used inside the pods. Innokin opted to use their PLEX3D Next Generation 3D Mesh Coil system inside the pod. If you haven’t heard of this coil tech before, it’s essentially a mesh made out of fine, “micro-grooves” which is supposed to heat more evenly, efficiently, and provide a better flavor that lasts longer. This technology is also used in Innokin’s iSub B tank. The pods themselves have a 2.8ml capacity and rate at about 0.5-ohms. If you’ve ever owned a pod mod, then you’ll probably know how to fill this guy. Most pod mods have adopted the same standard method of filling (probably because they haven’t figured out anything better yet). It’s a bit messy if you aren’t careful, so always fill with caution. Take the pod out of the DV with a pull, locate the silicone plug on the bottom of the pod, pull up the stopper side, fill the pod with freebase liquid or salt nic juice, and reseal with the silicone plug. Remember to let it sit with the juice to prime for about five to ten minutes. And of course, pop the pod back into place. First off, it’s three clicks of that firing/power button to turn the DV on and off. The Innokin DV Pod System is just about as easy as it gets, but since there are a couple of different features, let’s go over them. Once you turn on the device, you can start vaping right away if you wish, simply by taking a draw. What about the button, you ask? Well, the DV lets you use the button to fire if you really want to, but also uses draw-activated firing, so you can do either way. What’s important here, though, is the ability to swap through four wattages settings. The DV lets you choose between 12,13,14, and 15W. To change the wattage, simply hold down the wattage selection button (the little protruding blue stripe next to the DV logo) and you’ll see the screen selection change. The display screen is simply there to show you what wattage you’re vaping at. Behind the power button, you’ll see the battery life indicator lights. When you’re charging, you’ll probably notice the light is red, or when fully charged, green. But you can also keep track of the battery life while you’re vaping. When the light is green, your charge is full or above 50%. At 50%, the light will be yellow. And finally, when the battery is very low, the light will appear red. I tried both a freebase e-liquid with the DV, as well as a salt nicotine e-liquid to see how both faired. At 12W, the freebase liquid in the pod wasn’t coming through like I wanted it to. It was a cool, mildly flavored vape, with the slightest throat hit. I wasn’t too surprised, considering that’s a really low wattage, and the juice was only a 12mg. I didn’t notice a change at 13W, but 14 and 15W I was able to get a stronger flavor and an increased throat hit. Overall though, the experience with the 12mg of e-liquid wasn’t mind-blowing. However, when I tested the DV Pod System out with a nicotine salt juice (I used Barnyard Berry Salt Nic from Fresh Farms E-Liquid) the flavor came through much better, and so did those throat hits. If you’re looking for a stronger throat hit from a pod system, then I think the salt nic options are a bit better for the DV. I later tried an 18mg e-liquid and was still of the same opinion. While I preferred the Innokin DV Pod System with a salt-based nicotine juice, that doesn’t mean it didn’t function well with the freebase juices. It’s most likely a personal preference there, however, the flavor was stronger and so was the throat hit, with salt-nic. Overall, I really like the feel of the Innokin DV, and the flavor from the PLEX3D Mesh in the pods was quite nice. My pod lasted about two weeks, which seems reasonably normal to me. While I really enjoyed how this vaped, other vapers who do not prefer a relatively looser MTL vape, will not. Can I see this being a daily vape device? Absolutely. It’s a great options for beginners, MTL vapers, or those who want portability. Purchase the Innokin DV Pod System from Lizard Juice. Want to read reviews on other pod systems? Check out our hardware reviews. Like what you just read? Consider clicking one of the affiliate links or using the Vape Deals page on the site. You get the chance to buy products (often at a discount) from great companies, and we get a small percentage of the purchase price — which helps keep the lights on and pay for more great content. It’s a win-win!